Exporting is the process of saving a Region, Track or Session to a file on your computer. You may wish to Export only a Region of your Session, perhaps to use as a sample in another application, or to Edit it in a different editor program. To Export a Region, select it (so it becomes blue), and then right-click Export or use the top menu: Session > Export > Export selected regions to audiofile. This will open up a dialogue box with several options. 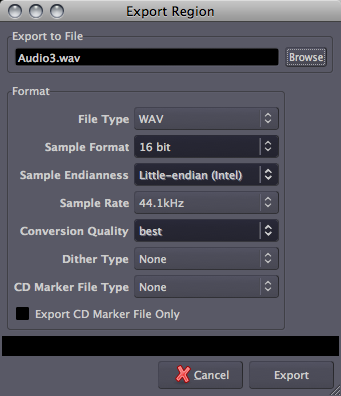 You'll usually Export as an AIFF or WAV file, at either 16-bit or 24-bit. 16-bit files can be burnt directly to an audio CD, but if you intend the audio to be further processed, it is best to export it at 24-bit. Having chosen your options, enter the track name at the top and select Export. Warning: overwriting existing files causes Ardour to become confused, resulting in empty files being Exported. Be sure to use a unique file name each time you Export! Please note that when exporting a Region, not all parameters and edits are Exported. Trimmed, split, stretched and reversed regions can be Exported, but edits such as Normalizing, Fading and Panning, and Automation are not Exported. Also, the volume of the audio Track itself or the Master Bus will not affect the Exported file. To Export these edits, please see the chapters on Exporting a Range and Exporting a Session. In the next chapter, we will learn about Exporting Ranges rather than just an individual Region.